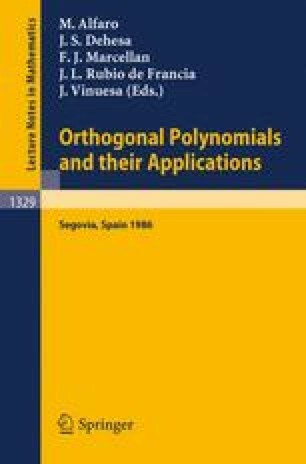 There are four sets of orthogonal polynomials satisfying differential equations of second order: The Jacobi, Laguerre, Hermite and Bessel polynomials. The first three are classical, with well known properties, including weights, orthogonality, moments. The fourth is less well known. A real weight has not been found. where μn is the nth moment associated with the polynomials and δ(n)(x) is the nth distributional derivative of the Dirac delta function. The first two are even distributionally orthogonal when their parameters A,B and α are less than −1. The first three satisfy a singular Sturm-Liouville problem, complete with singular boundary conditions involving Wronskians. The first, second and fourth sometimes generate indefinite inner product spaces. There are three new sets of orthogonal polynomials which satisfy singular Sturm-Liouville problems of fourth order. There are two known satisfying problems of sixth order, one known satisfying a problem of eighth order. They also have some interesting properties, including a distributional weight, the generation of indefinite inner product spaces, satisfying differential equations of second order in which the coefficients vary with n.